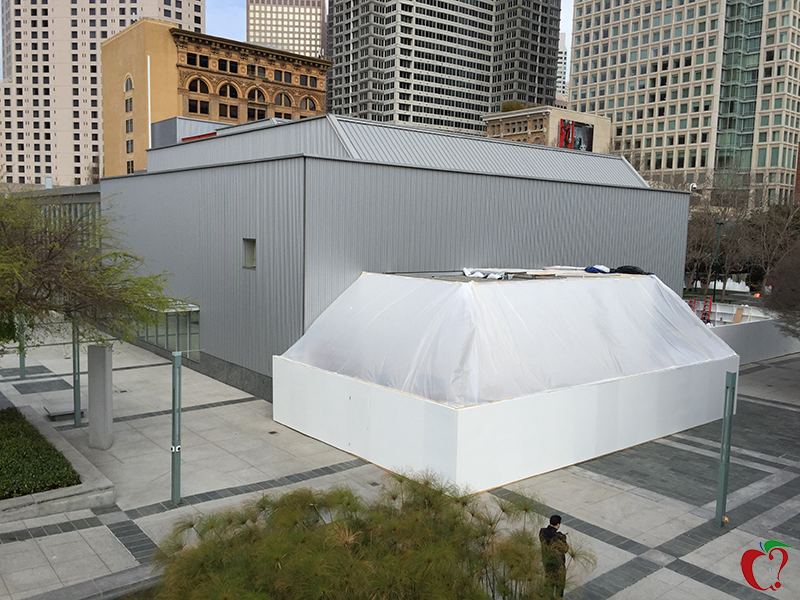 Apple is working on construction of an outdoor extension at the Yerba Buena Center for the Arts in San Francisco, as first reported by 9to5Mac. The tented space will likely serve as an Apple Watch demo area at the upcoming "Spring Forward" media event on March 9th, where Apple is widely expected to provide further details about the Apple Watch's features, pricing and release date. According to the tipster that submitted the original photo, there are security guards wearing "Apple Security" shirts monitoring the construction site, all but confirming that the external addition belongs to Apple. The company previously built a similar structure outside of the Flint Center as a demo area for the iPhone 6, iPhone 6 Plus and Apple Watch, so an exterior demo area would not be unprecedented. Apple sent out invites for its "Spring Forward" media event earlier this week, and will also be providing a live stream of the event on its website for Mac, iPhone and iPad. The media event will take place at the Yerba Buena Center for the Arts in San Francisco on March 9th at 10:00 AM Pacific and should be focused on the Apple Watch ahead of the wrist-worn device's launch in April. Since we're sort of on the topic. Why should people skip out on the first generation products, such as the Apple Watch? The vocal majority seem to say that getting the second iteration of an Apple product is better, like getting Apple Watch 2 or iPhone6S+ etc. Wouldn't be better to get first iteration, skip the minor upgraded update to the product, and then if one feels to upgrade, get the first iteration of the new product, i.e. iPhone 7,7+ etc. ? That way, one gets to experience the newest tech without having to worry about waiting for the inevitable update to the product. It doesn't make sense to skip the first generation. The argument holds if you already have a device but given this is the first iteration there is no reason why not to buy and enjoy it. Can I ask, which site is best for breaking Apple news. MacRumors or 9to5mac? Each site has its merits. I like 9to5 Mac for its breaking news and superior journalism, and MacRumors for its vibrant community and forum comments. Wouldn't it be better to get first iteration, skip the minor upgraded update to the product, and then if one feels to upgrade, get the first iteration of the newest product, i.e. iPhone 7,7+ etc. ? That way, one gets to experience the newest tech without having to worry about waiting for the inevitable update to the product. It is a vocal minority. You sell Your $350 watch for $250 next year and buy a new one. You essentially spent $100 to use the watch for an entire year and live your life instead of hiding in the corner fearing and complaining about change and risks. Plus with your new watch you get another year of warranty. man im excited for additional details on apple watch!!!!! Now riddle me this. Who actually leaves home without their phone these days? Not leave home. Go on a run. Or a walk in the park. You just go out, get your daily excersie for 30 minutes, then come back. That's like saying i'll be arrested on the spot if i leave my house with a t-shirt, saying "Security" on the back of it..
Not sure what you mean by that, but I can tell you Apple Security means business. Wander into their protected perimeter and a red dot will appear on your forehead. Seriously, I've tested it. A flying tackle is not out of the question if they think you are snooping.